"Once in a blue moon, someone turns up whose work is so exceptional that he, or she, gets a "thumbs up" from everyone. Such was the case with 85 year old Stanley Mason. The retired fisherman spends his days at his window overlooking Merigomish Harbour, painting on blocks of quilting fabric. Scenes remembered from his 74 years in the fishery. Villages, birds and animals comprise the subject matter of these wonderful creations." Stanley was born at The Ponds, Merigomish, and was a fisherman for more than 70 years. 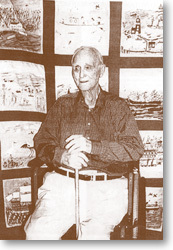 In January of 1995, while confined to a wheelchair because of bad health, Stanley took up painting. He first painted on placemats, then switched to fabric blocks that his wife sometimes incorporated into her quilts. After being discovered by the Nova Scotia Folk Art Festival Society, Stanley was invited to participate in their annual folk art festival. Because of his poor health, Stanley was not able to attend the festival personally. His painted quilt panels were, however, featured at three festivals where they proved to be very popular. Stanley passed away in November, 1999.